To investigate the streams flowing into the Pudding Brook. Three streams run into the Pudding Brook near its source and I was curious to investigate them at the points where they join the brook. In the parkland on the right hand side of the road, going from Corsham to Chippenham, there is a shallow pond, formed by springs, which flows under the road and into the stream labelled Pudding Brook on the map. The other streams flow down from the higher ground on the north side of the A4. Two small streams converge to make up the first one which then passes through Mynte Farm and Chequers Farm, and under the A4, before entering the Pudding Brook. The other stream starts at Biddestone Manor and joins the Pudding Brook further along: this one receives the spring water from the Holy Well. The air was cool but the days were getting longer and we had enough light to see. We parked on the road leading from Chequers crossroads to Easton Lane and looked over the wall at the shallow pond fed by springs which seeped out between clumps of grass. 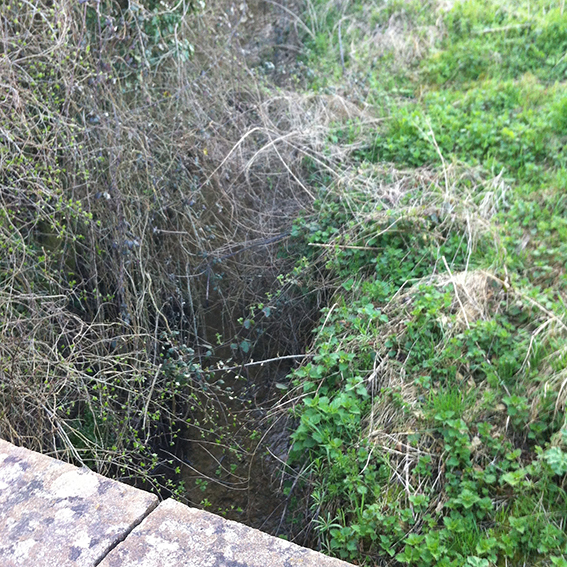 The small amount of water in the pond flowed through a narrow gap at the base of the wall and came out the other side of the road into a small overgrown ditch which carried it to the Pudding Brook. We crossed the A4 and walked along for about 20 yards towards Chippenham. All the land on this side was higher and sloped steeply down to the grass verge at the side of the road. A stream ran alongside the garden of Chequers Farm; its banks had been cleared and a small wooden bridge led into the field beyond. This stream appeared to be the one which also flowed through Mynte Farm yard. There had been heavy rain and all the watercourses were full. Further along the road was the other stream, coming down from Biddestone and picking up the water from the Holy Well; it was overgrown with brambles but it flowed swiftly below them and we crossed the road to see it emerge from under the red-brick and concrete bridge into the field where it joined the Pudding Brook. It was almost dusk when we edged into the field through a leaning gate and over a low electric fence. There were sheep with lambs, and the stream meandered along, crossed by a low platform of large wooden planks. The lambs were jumping and bleating. We followed the stream until it joined the Pudding Brook then carried on walking back along the brook until we came to the point where it was joined by the stream which flows through Mynte Farm. By now we were on the Corsham parish boundary and in the field a few feet from the brook there was a very old tree, possibly one of those which were notched on the 18th Century perambulations. Here there were primroses all along the banks of the brook. We stood for a while in a small scrubby group of trees where the streams converged; a quiet place where it seemed nobody went. Beyond this point the parkland water, in its ditch, coming from the west, split into two and formed a small island, the dark water barely moving around it. The grass, already long, was a rich green. The air grew colder. The Mynte stream was very overgrown with hedging and we followed its slight curve back to the road, climbed over the fence and walked along the grass verge, now grey in the half light, back to the car. North of the A4. The stream which runs through the two farmyards. North of the A4. The stream which flows from Biddestone. Looking south of the A4. The Biddestone stream meanders towards the Pudding brook. Lambs by the Biddestone stream. The A4 in the background beyond the fence.